Warning: claims about Rockefeller owing his longevity to leading a “simple life” are probably as bogus as claims about transplants. So what does he owe his longevity to? Despite what is claimed below, we don’t believe Rockefeller owes his longevity to organ transplants, although some sort of “sacrifice” on the part of others may well have been involved. Certainly just looking at his photo it’s easy to believe that he’s been sustained by the sacrifice of others well being. Ed. David Rockefeller. Truly he wouldn’t be out of place in a Dracula or Frankenstein movie. 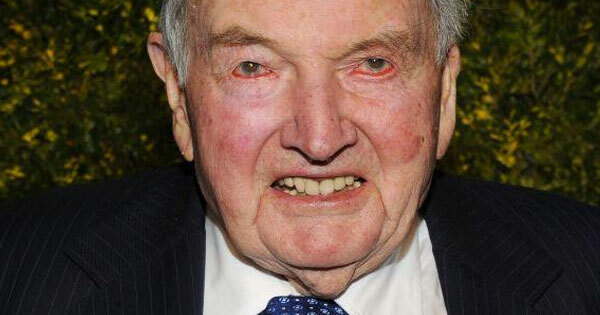 Last week (June 12), David Rockefeller celebrated his 100th birthday without much ado. He might have added that having a heart transplant every 6-7 years might have been a factor. Rockefeller has had six heart transplants since 1976 when a car accident led him to suffer a heart attack. He has also had two kidney transplants in 1988 and 2004. Just two months ago, the billionaire “philanthropist” had his sixth heart transplant.